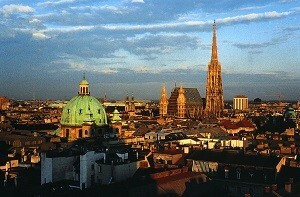 History is everywhere in Vienna and much can be seen in a few days on foot within the city centre. Start in St Stephen’s Cathedral, the soul of Vienna. Haydn, Mozart, Beethoven and Schubert all knew this church well and you can hear their music here today. From there it is not far to the shops of the Mariahilferstrasse, or you can explore the smaller central by-ways with their unique bars and cafes. Walk towards the river and under the Anker Uhr with its twelve figures who help to strike each hour, and you will soon find the ancient Ruprectskirche. In the opposite direction is the magnificent Hofburg Palace, where Austrian emperors ruled half of Europe when the British Empire was just some far-flung territories overseas. Beyond the palace is the Heldenplatz (Heroes Square). Pause only to visit the Volksgarten (people’s park) and you will soon arrive at the museums quarter, where you will find galleries and museums capable of absorbing all the time you can spare. 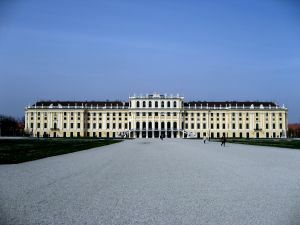 The magnificent Schonbrunn Palace was the summer residence of the Habsburg monarchs. Dating back to the seventeenth century, the palace is set in extensive gardens. Further out, but easily reached by public transport, are the Belvedere Palace with its wonderful art collection, and the Secession building with avant-garde art from a century ago. Other Buildings which will fascinate are the Opera House, the Burgtheater, and the Karlskirche with its stunning green dome. 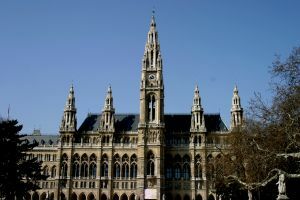 No visit to Vienna would be complete without time set aside to sample the food and drink of the place, most especially the coffee and the sweet dishes served with it.